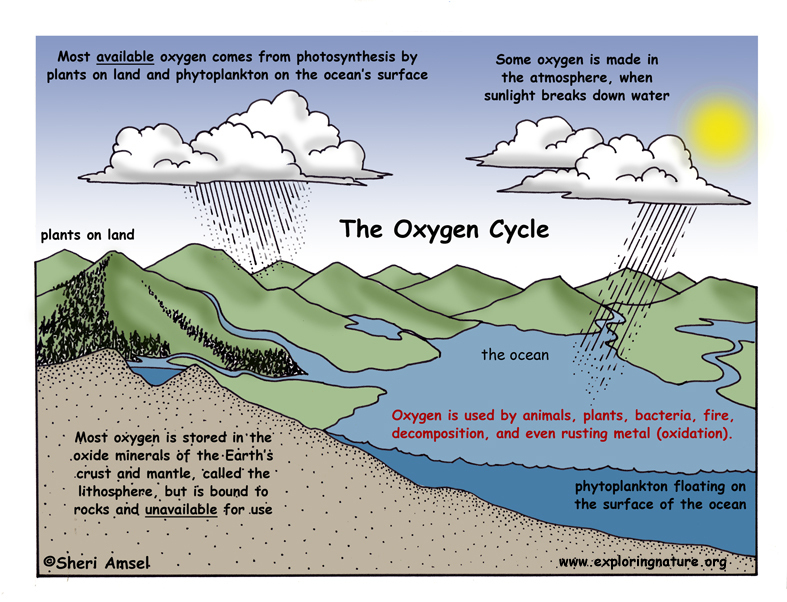 There is a cycle on Earth that replenishes the vital supply of oxygen that all living things need to survive. 1) We use oxygen for respiration and it’s a process we can never stop doing until we die. We inhale oxygen and exhale carbon dioxide along with all animals, plants, and even bacteria. 2) When plants and animals die and decompose, that process uses oxygen too. 3) When you burn a fire it uses oxygen. Oxygen is needed for processes all over the Earth. 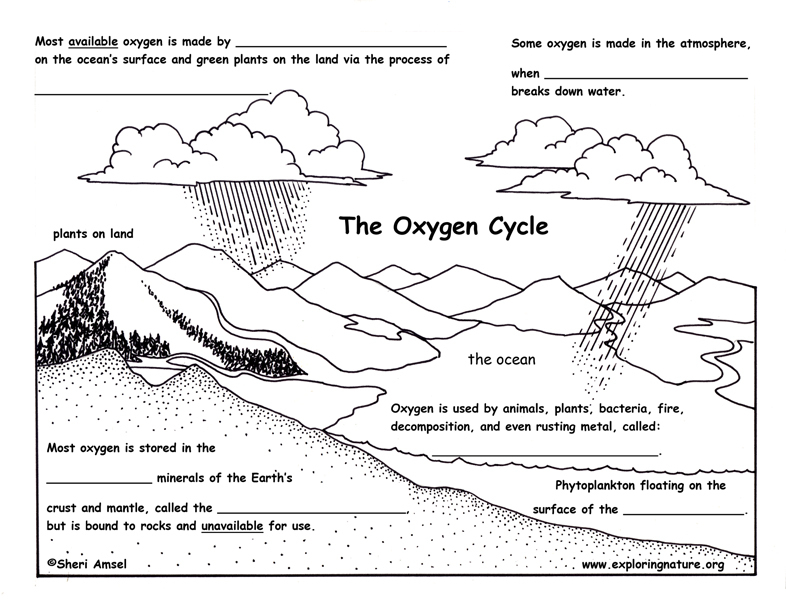 With so many living using oxygen, it is important that the oxygen cycle is always making more! Where do we get oxygen? 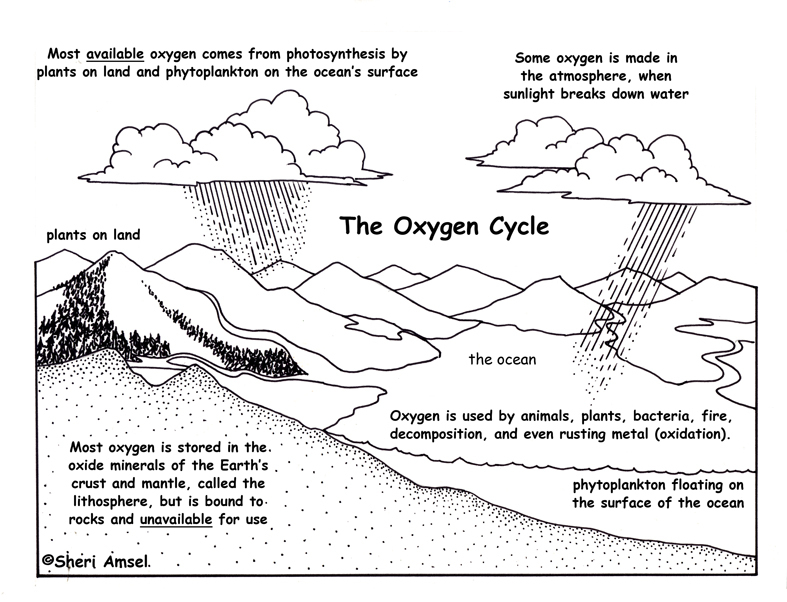 1) Some oxygen is made in the atmosphere, when sunlight breaks down water. 2) A lot of oxygen is stored in the oxide minerals of the Earth’s crust and mantle, called the lithosphere. This oxygen though, is bound to the rocks and can’t be used by living things. 3) Most oxygen available to us comes from photosynthesis made by plants on land and phytoplankton floating on the surface of the ocean. Photosynthesis is a process where the organism, powered by sunlight, takes carbon dioxide and water and releases oxygen and sugar. This is how they make energy for themselves and luckily, oxygen for us!